Before the invention of the electric tel­egraph enabled man to outrival the boast of Shakspeare's Puck that he would "put a girdle round about the earth in for­ty minutes," the carrier-pigeon afforded the most rapid means of conveying intelligence between places far remote from each other. In ages the memory of which is dimly preserved in vague legends and traditions these graceful couriers of the air were employed to carry messages of love and war. It is surmised by some writers that the "dove" let loose from the Ark, which returned at even-tide with an olive branch in its beak, was a carrier-pigeon; but not to go back so far, we have au­thentic instances of their employ­ment by the ancient Egyptians. According to Wilkinson's work on the manners and customs of that people, on one occasion when an Egyptian king assumed the double crown of Upper and Lower Egypt, a prince let fly four pigeons, and commanded them to announce to the south, north, west, and east that "Horns, the son of Isis and Osiris, has put on the splendid crown of the Upper and Lower country; that the king Ramses III has put on the two crowns." Several instances of their use as messengers occur in classical his­tory. At the memorable siege of Mutina, Hirtius and Brutus held constant communication by this means, while Anthony, through whose beleaguering host no courier could make his way, beheld with rage and chagrin the passage to and fro of these aerial messengers. In vain he tried every expedient to intercept them. Nets and lures were of no avail, nor could his strongest and most expert archers bring them down as they sped their way, far above the camps, between the besieged and their friends. Anacreon, in one of his exquisite odes, gives the carrier-dove a more gentle mission than carrying bul­letins of war; and if we are to be­lieve the poets and romancers of the Middle Ages, it was the most trusted messenger between parted lovers. 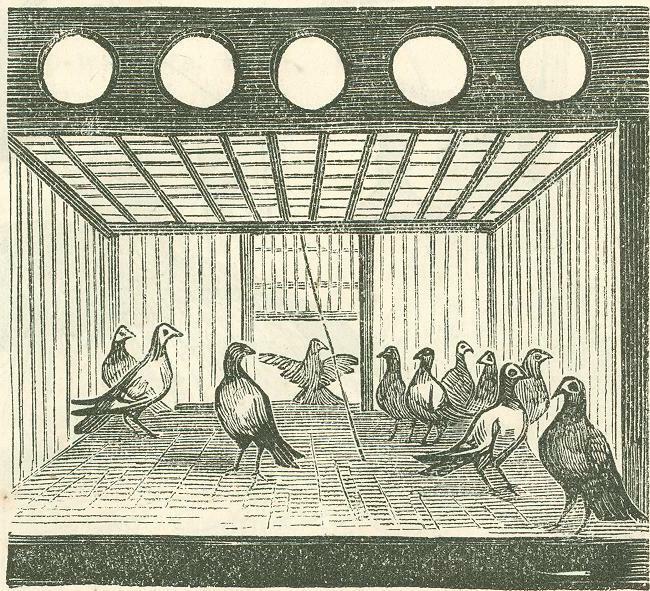 Wealthy Romans carried pigeons in baskets to the Amphi­theatre, for the purpose of sending home the names of guests whom they invited at that place of amusement, or to order a change in the dinner. The building being open at the top, the released messengers would rise above the walls and fly home with the important information. Tasso refers to the employment of carrier-pigeons at the siege of Jerusalem, and relates how Godfrey, commander of the Chris­tian host, on one occasion protected one of these messengers from the attack of a falcon which had been let loose by the in­fidels to destroy it. It is a historical fact that they were employed during the crusade of Louis IX, in 1219. When the Christian army attacked Mansurah the Saracens sent off a pigeon to Cairo with a billet announ­cing the fact attached to its wing, and later the same day another pigeon was dispatched to carry the news of the total defeat of the French. 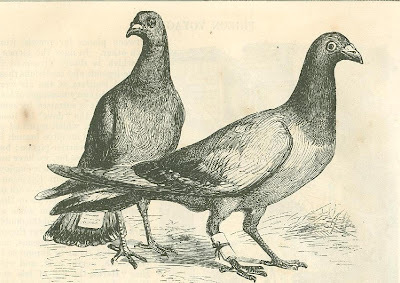 Sir John Mandeville, the eminent English traveler, who visited China during the reigns of Edward II and Edward III, mentions the use of these pigeons as one of the customs of that country. In fact, they are still employed to a great extent in all the Oriental nations, both by the state and by private persons. 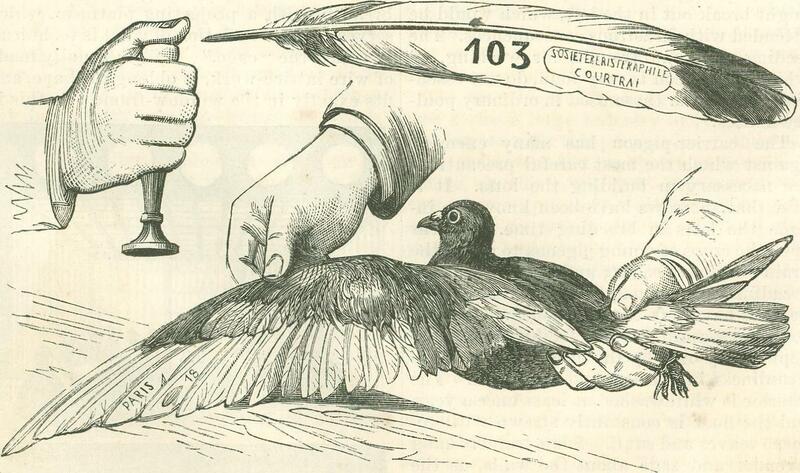 Since the general introduction of the elec­tric telegraph the carrier-pigeon has lost much of its importance in Europe as a news carrier; but down to a very recent period it was always employed when celerity as well as security was desired. During the Napo­leonic wars news of great battles was trans­mitted to governments and private parties by this means when the ordinary modes of sending dispatches by couriers were attend­ed by danger and delay. 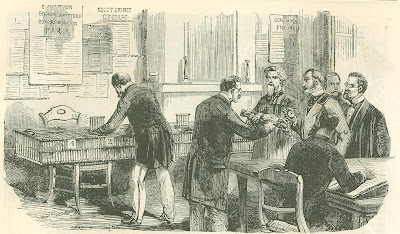 They are still, or were until very recently, employed in En­gland to announce the result of the great races, affording a surer and speedier means of transmitting private intelligence than the overcrowded telegraph, over which messages are frequently delayed for hours by the press­ure of business. The winged messenger in nine cases out of ten would arrive at its des­tination while the dispatch was still wait­ing its turn on the telegrapher's desk. Many pigeons fall victims to the guns of dishonest persons, who conceal themselves at a distance from the race-course for the purpose of shoot­ing the winged messengers, and appropri­ating the intelligence they bear. The fine for this disgraceful practice is quite heavy, but many persons are willing to take the risk. Before the submarine cable was laid between France and England captains of packets used to carry baskets of pigeons to let fly in mid-channel, or on arrival; and the state of the market on either side, and other commercial news, were communicated by the same means. Great speculators in the funds, like the Rothschilds, could not wait for the slow courier. Even special messengers with relays of horses at short distances could not travel rapidly enough to suit them. In order to get the news in the shortest possible time, they established a regular service of carrier-pigeons, with places of reception on both sides of the Channel; and messages in cipher were thus transmitted by aerial post with a celerity and dispatch equaled only by the telegraph at the present day. Many curious anecdotes are told of the mishaps sometimes suffered by the aerial post. It is related of one messenger who was entrusted with a pair of well-trained and very valuable carrier-pigeons, which he was to take to a certain point, and send back with a very important dispatch, that on entering a hotel he gave the birds to a servant and ordered breakfast. He waited a long time, but was at length served with a delicious fricassee. After paying his bill he called for his pigeons, when, to his horror and dismay, the waiter exclaimed, "Your pigeons? Why, you have just eaten them!" The speed of the carrier-pigeon has been generally overrated. Careful experiments have shown that thirty miles an hour is the average, although, in a few well-authenti­cated instances, thrice that speed has been attained. In 1808 an English gentleman laid a large wager that his pigeons could fly thirty-five miles an hour. To decide the question, three of his trained birds were taken exactly that distance from his resi­dence, and let loose in the presence of wit­nesses. They arrived home together in just fifty-three minutes, or seven minutes ahead of time. 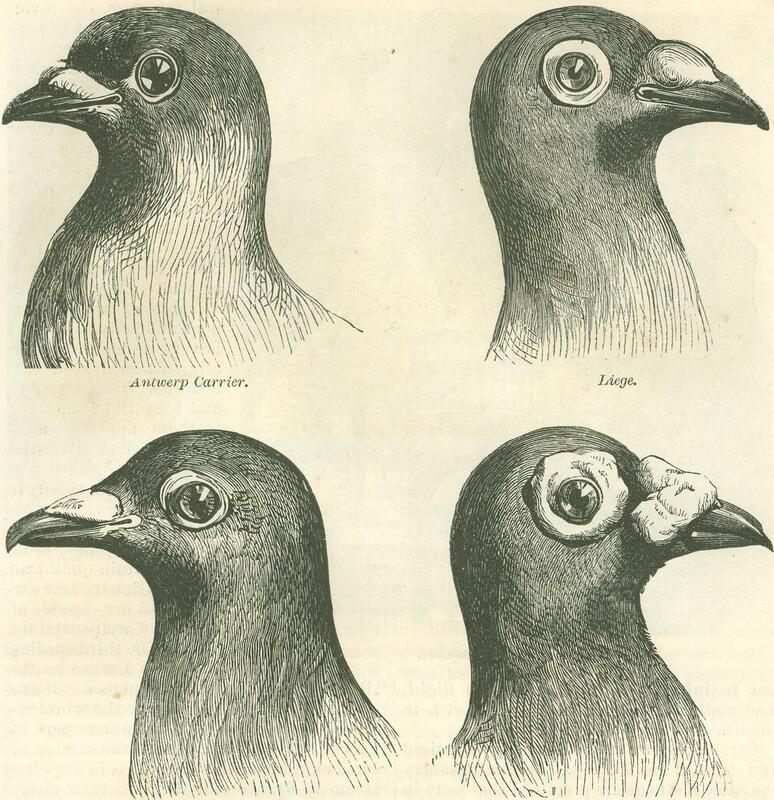 In 1838, during the great annual trial of carrier-pigeons at Ghent, twenty-four birds were let fly at Rotten, one hun­dred and fifty miles distant, at five minutes before ten in the morning. Their flight was carefully timed. One of them reached Ghent in one hour and thirty minutes, having trav­ersed the distance at the marvelous rate of more than ninety miles an hour. Sixteen made the journey in two hours and a half. Several were never heard from. In the East wonderful stories are told of their speed and endurance. The traveler Lithgow tells us that one will carry a letter from Babylon to Aleppo in forty-eight hours, the places being thirty days' journey apart by the slow modes of travel used in the East. But the stories of early travelers are to be taken with many grains of allowance. Although for a short distance, or in exceptional cases, the carri­er-pigeon may attain a much greater speed, thirty miles an hour is probably its average. It could not sustain a long flight with greater velocity. Even this speed cannot be maintained without rest, for the carrier-pigeon has not the endurance which belongs to many birds of passage. It always descends at night for shelter and repose, and hence it can rarely fly across a wide expanse of water. To this was partly owing the failure of the attempt to use them for conveying intelligence from the arctic explorers, and partly to another cause. Some writers, chiefly poets and ro­mancers, would have us believe that the carrier-pigeon finds his way home from re­mote places by a kind of instinct; but this is not the case. Its flight is guided by sight alone. When let loose from confinement it rises to a great height in the air by a se­ries of constantly enlarging circles until it catches sight of some familiar landmark by which to direct its course. If flown on a foggy day it soon becomes bewildered and either returns to the place of flight or is lost. Let loose from a balloon on a clear day, and too far above the ground for objects thereon to be discerned even by its piercing vision, instead of rising, it drops perpendicularly, like a plummet, until it nears the earth, when it begins to wheel round in a descend­ing spiral, constantly increasing in diameter, evidently for the purpose above mentioned of ascertaining its locality, and discovering some indications for the direction of its course. Carrier-pigeons were of great service to the French during the late siege of Paris by the German army. This had been fore­seen by the German commanders; and in order to prevent the importation of these invaluable messengers from Belgium, where they are raised and trained in almost incred­ible numbers, they were very early in the struggle declared contraband of war. But in this matter at least the French had been provident; and long before a German soldier had crossed the Rhine the military authori­ties had collected twenty-five thousand pig­eons, which were distributed among the commanders of the various cities and for­tresses most exposed to the danger of a siege, to be used as a means of communication. 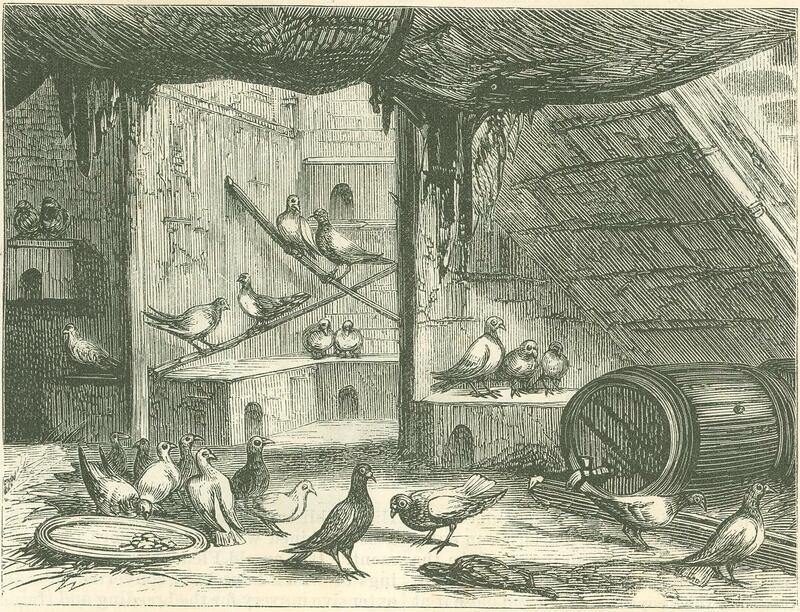 A depot was established at Bordeaux for the reception of new pigeon recruits. After the fatal lines were drawn around Metz and Paris, and all telegraphic communication with the world outside had been severed, news and orders were sent and received daily by the pigeon post. The missives had to be written on the smallest scraps of thin paper, in order not to impede the pigeon's flight, and the camera and micro­scope were called into requisition to crowd the greatest amount of news into the small­est compass. A whole side of the London Times was on several occasions photographed on a thin piece of paper less than five inches square. This microscopic newspaper, em­bracing news from all parts-of the world, was at first read by means of a powerful microscope; afterward it was thrown upon a white wall by means of a magic lantern in a darkened room, where it was read by thousands of people. The German commanders tried many ex­pedients to break up the pigeon post, with­out success. As a last resort they brought to camp a large number of trained hawks, which made sad havoc among the aerial messengers. This was denounced roundly by the French newspapers and orators, but surely without reason. In ancient times letters were fastened by a cord about the pigeon's neck, but at the present time the paper containing the mes­sage is attached either to the leg or under the wing. It must be very light, in order not to interfere with the pigeon's flight. The methods most in vogue are shown in the illustration on page 660. Carrier-pigeons are still extensively raised and trained in Turkey. In that country the same methods are practiced that were in vogue a thousand years ago. As soon as the pigeon is old enough to fly well it is taken a short distance from home and let loose, when it immediately flies home. The next day the distance is increased; and so on, day by day, until its training is com­plete. Birds that show themselves to be lazy in flight, or too stupid to find their way home with ease, are killed and eaten. This primitive mode of training satisfies the Turks, who believe in doing as did their fa­thers before them; but in France and Bel­gium, and more especially in the latter coun­try, more scientific methods are adopted. In Belgium, indeed, pigeon-racing is a na­tional sport, like horse-racing in England, and it is patronized and supported by all classes of society, from king to peasant. As these interesting birds are little known in this country, we propose giving in this arti­cle some account of the most approved meth­ods of raising and training them, and the manner in which they are utilized as mes­sengers. 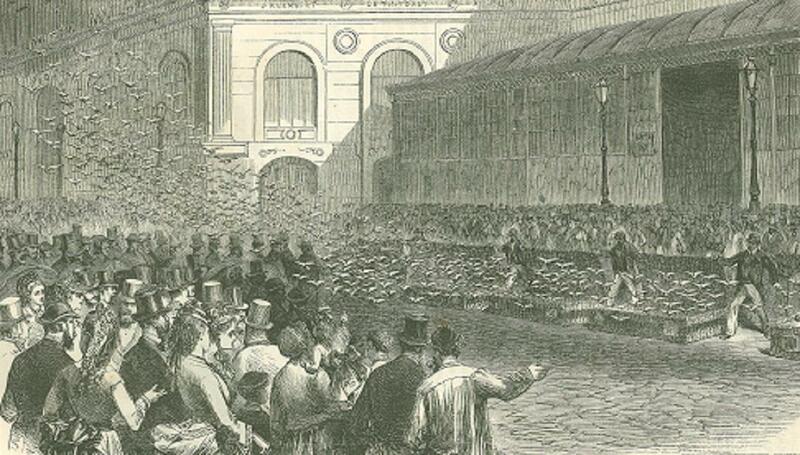 The Belgian societies are very particular in regard to breeds, of which there are sev­eral varieties, the favor­ite being the Antwerp carrier. This species, sometimes called "Volante," or "High-flyers," is of Flemish origin. It is superior to the other varieties. A thorough­bred Antwerp carrier is of medium size, with a straight, smooth beak, and the circle round the eye is delicate and nar­row. In color it is black or white, or white with splashes of red on the neck and body. Its flight is very rapid, and gener­ally sustained at a vast altitude. Great strength and breadth of the wing feathers are the most striking characteristics of the short-beaked pig­eons, which are chiefly in favor at Liege. They are pretty in shape, with round heads, fine beak, have a certain quaint air of affectation in their carriage, and are capable of swift and well-sustained flight. The third species, known in France as the "Bee Anglais," is an English pigeon. It is a powerful bird, remarkable for the white tu­bercles upon the soft, membranous part of the bill, and the breadth of the circlet of naked skin about the eye. It is held in less esteem in France and Belgium than either of the other two varieties. A fourth variety is obtained by crossing the Bec Anglais with the Liege pigeon. Of these different varie­ties the pigeon societies of Belgium alone possess more than six thousand trained birds, and establishments for breeding and train­ing are increasing every year. The breeding and training of carrier-pig­eons forms a large industry by itself. The appointments for this purpose are of the sim­plest character; but, as shown in the illustration on this page, from the outside at least, picturesque and attractive. The pig­eon-loft is frequently in the roof of some quaint old building. If we take a peep inside we shall see only rows of perches, nesting pans, and boxes, and pans for food and water. The boxes, or sleeping apartments, are of wood, rectangu­lar in shape, with a hinged cover, sloping toward the floor, and pierced with two open­ings to admit the occupants. At the base of each opening is a sill, on which the pig­eon alights on entering the box. One box serves for a pair of birds. They are arranged along the side of the loft where the light is obscure, as the birds prefer a darkened room at nesting time. Each box is furnished with two nesting pans of earthenware. The perches are round pieces of wood, and the arrangement of these in the loft is a matter of the utmost importance. They should be placed directly in front of the nesting boxes, or very near them, so that each pair may at all times stand guard over their own domi­cile; otherwise, as the pigeon is a quarrel­some and aggressive bird, a domestic war might break out in the loft, which would be attended with disastrous consequences. 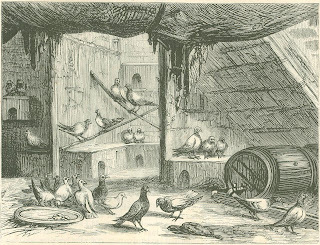 The feeding pans and troughs for washing, of which the pigeon is very fond, do not essen­tially vary from those used in ordinary poul­try-houses. The carrier-pigeon has many enemies, against which the most careful precautions are necessary in building the lofts. It is said that sparrows have been known to in­vade the lofts in breeding time, and tear open the crops of young pigeons to get at the grain they have eaten; and cats often make dreadful havoc among them when negligent keepers have left the door open. Another enemy is vermin. These frightful pests are kept at bay only by the utmost attention to cleanliness in the loft and the boxes. The interior is whitewashed at least once a year, and the floor is constantly strewn with to­bacco leaves and snuff. Some trainers hang lavender and sage about the walls, as the pigeons are said to be exceedingly fond of aromatic odors. A French writer satirically remarks that the next thing we shall hear of is a piano-forte in every pigeon-loft, as these luxurious creatures often exhibit a remarkable love of music! 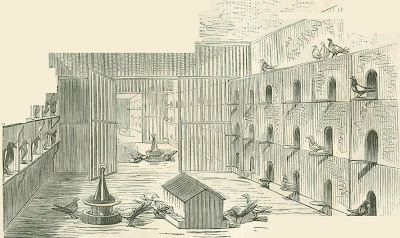 Another indispensable feature of a well-constructed pigeon-loft is the "trap," to regulate the ingress and exit of the birds. 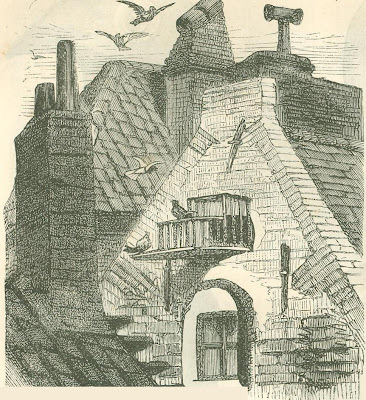 This comprises a dormer-window, a cage, and a trap-door. The dormer-window is of mod­erate dimensions, in height less than in breath, with a projecting platform, which serves as the foundation of what is technical­ly called the "cage" This is usually made of wire lattice-work, is oblong in shape, and fits exactly in the window-frame. To this is fitted a trap swinging door, so arranged that a pigeon alighting on the platform can enter the cage, but cannot push it open from the inside. The door is also fitted with a cord, by which the keeper can open and close it at -will. The reason for placing a pigeon-loft at the top of a building is that it may form a conspicuous object, easily discerned from a great distance. 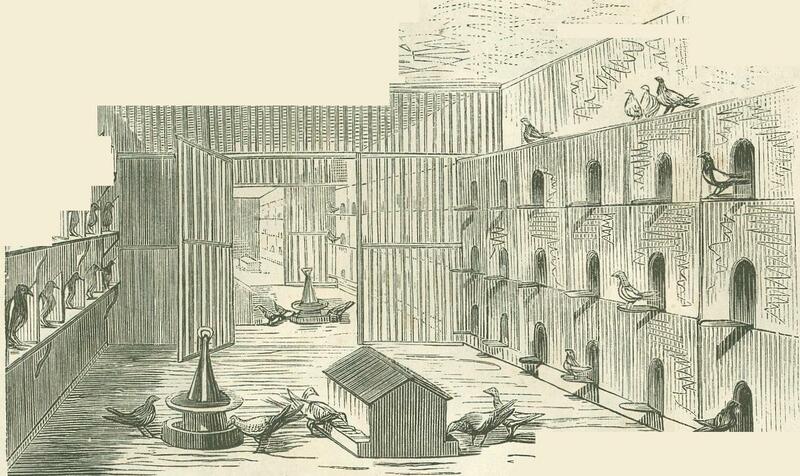 There are, of course, many varieties of pigeon-lofts, according to the fancy of proprietors. The most approved model for the interior, now adopted by the chief societies of Belgium and France, is shown in the above illustration. The most successful proprietor and train­er of pigeons in Belgium is M. Verhalst, of Courtrai, the winner of the last great race. His establishment is a model of picturesque­ness combined with every modern improvement. It is an old Flemish farm, the Wild­ings of which have been converted into an extensive nursery for the breeding and train­ing of pigeons. Everything about the premises is kept in the most perfect order. The tile pavement of the court-yard is as free from dirt as a parlor floor, and all the utensils are polished to a silvery brightness. The pigeon-boxes are of mahogany, and shine like mirrors. But we must come to the races. The most favorable time to take the male for the course is when its mate is nesting. Conjugal affection will hasten his return. The female should be taken when her young are not yet sufficiently grown to dispense with maternal care. It is not safe to take them on long expeditions at this time, as both parents are needed to take care of the young, which might suffer, and perhaps die, in the too prolonged absence of their natural guard­ians. Old and young pigeons are not allow­ed to fly together in the same race, and a particular mark is placed upon the wing of the young to prevent frauds. The training for the course begins when the pigeon is about a month old. It is then taken a short distance from the nest, and al­lowed to return. The distance is gradually increased until the pigeon is able to make a journey of several miles. For instance, a winning pigeon in a recent short race, which took place in August, was hatched in March. At the age of two years the pigeon arrives at its full strength, and is able to make long journeys, and take part in the grand matches. These matches are governed by strict rules. Each society or proprietor desiring to enter pigeons for a race is required to pay a cer­tain fee for each bird. Every pigeon is reg­istered by the society under whose authority it is entered, and receives a private mark under the wing, by which it can be recog­nized. Its age, name, with full description of its peculiarities, are entered on the books of the society. An impression of the mark is enclosed in a bag, not to be opened until the public distribution of the prizes. On the day of the race the birds are en­closed in baskets or hampers, to be taken to the place of departure. On arriving at the rendezvous the baskets are placed in order on the ground side by side, and on a given signal the covers are simultaneously raised. When first released the pigeons fly close to the ground for a few seconds then begin wheeling round and round, rising higher and higher into the air, until they finally take their flight for home. The hour of their departure is carefully noted by chro­nometers. At home the attendants of the society are anxiously waiting for their arrival. At each loft may be seen the watchers, strain­ing their eyes in the direction from which the feathered racers are to come. A dele­gate from each competing society is gen­erally present to insure fair play. The exact time to a second of the re­turn of each bird is noted by the aid of the most accurate stop-watches, such as are used on the race-course; and when the telegraph can be used the color and stamp of each bird is at once transmitted to the station of depart­ure. Where the telegraph does not exist, other arrangements are made for sending the intelligence. 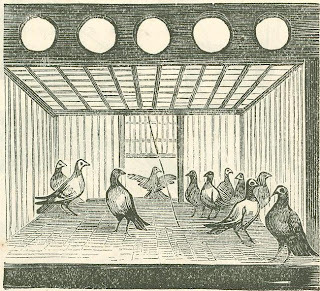 The pigeon, on returning to the loft, is immediately taken by an attendant, placed in a little willow-work basket, the upper part of which is closed by a cover of cloth, and lowered to another attend­ant waiting below, who takes it in his teeth and starts off at full speed to the office where the delegates are in waiting to take its num­ber, stamp, name, and time of arrival at the loft. 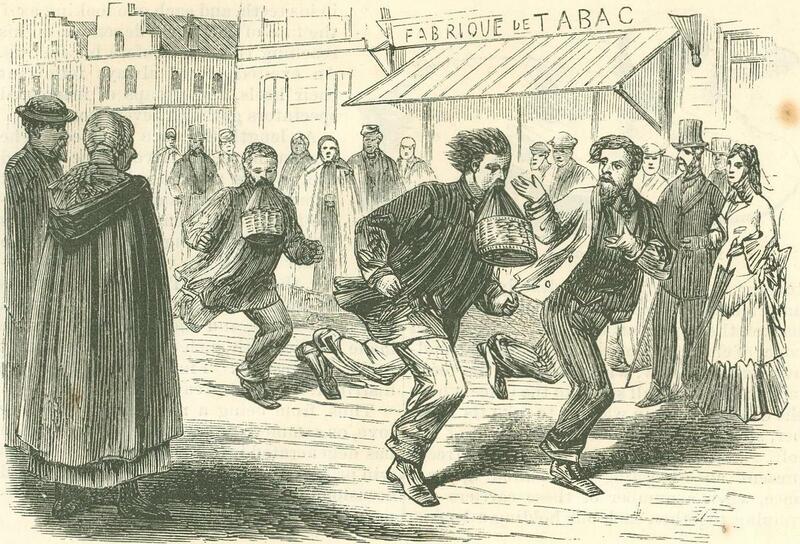 During important races the streets present an exceedingly animated appear­ance, when a number of these carriers are running together, each one holding a basket in his teeth, and each one looking as if the fate of the world depended on his reaching the office before his fellows. An excited crowd always follow at their heels, and groups of interested spectators gather at every corner. At length the race is ended. The pigeons have all arrived. The winged competitors are ranged in open-work hampers on each side of the commit­tee-room. The identity of each bird is fixed by comparing the marks on the underside of the wing with those re­corded in the books. The time of each is carefully noted. The pigeons are returned to their owners, and the result of the race made public, with such details as are likely to be interesting. Finally, the prizes are distributed amidst great festivities. Thus, from being a messenger a war, or love, or commercial news, the carrier-pigeon has degenerated into a mere sporting bird to win prizes and wagers for idle men, and afford occasionally a day's amusement and excite­ment. From Harper’s New Monthly Magazine – April 1873.